T.S. Eliot, an Anglican himself, wrote “the historical sense involves a perception, not only of the pastness of the past, but of its presence.” History is a matter of perception. It contains our worst assumptions and our truest truths – any time we come in contact with it we are changed. The many gifts of the people of faith who have built up this community in the past have provided a strong foundation for a vital parish of the future. 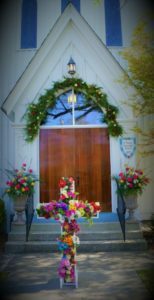 Anglican worship in Beaufort dates back to the arrival of the first settlers, soon after 1700, as was the case in all the English colonies. After the American Revolution, when British institutions generally gave way to America replacements, the Anglican tradition re-emerged in the shape of the Episcopal Church we know today. However, in post-Revolutionary Beaufort, Anglicanism entered a dormant phase that lingered until the 1850s. 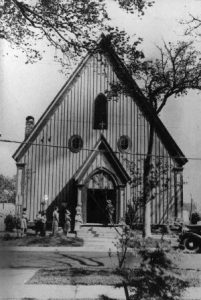 St. Paul’s Parish was organized on Sept. 1, 1855, under the guidance of the Rev. David D. Van Antwerp, a U.S. Army chaplain stationed at Fort Macon. 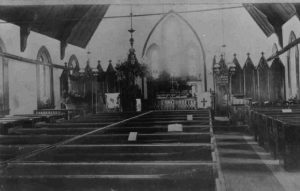 Original parishioners included William J. Potter, Isaac Ramsey, Robert E. Walker, James J. Whitehurst, Samuel S. Duffy, Elizabeth F. Duffy, Josephine E. Jones, William Cramer, D.B.L. Bell, J.B. Moore, and Caroline S. Pool. Their first service was held in the Academy of S.D. Pool. Toward the end of 1855, the Beaufort Baptist Church, which lacked a pastor, invited the Episcopalians to hold services in the Baptist sanctuary. This continued for more than a year. 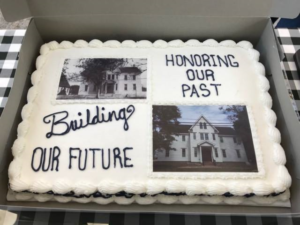 Construction of the present building began in early 1857 on a lot that had been purchased by the Vestry of St. Paul’s a year earlier from Abigail Hill for ten dollars. “On April 14th, I laid the corner-stone of a church at Beaufort, by the name of St. Paul’s. Messrs. Greene and Van Antwerp taking part in the service; on this occasion I delivered an Address, and in the evening preached, and confirmed four persons. Mr. Van Antwerp, our diligent and unwearied Minister at Beaufort, deserves not only our commendation, but our aid in his efforts to build a Church and establish a congregation in a place where he found but one communicant, much ignorance of the Church, and much prejudice against it, and very little sympathy or cooperation at home or abroad except at New Bern, where he has received kind, timely and effectual aid. Today’s visitor to the church will note that the simple, box-like pews have clearly seen a lot of use. In fact, they are the original “temporary” pews that, for one reason or another, became permanent. The building was consecrated by Bishop Atkinson on May 21, 1861. That is a significant date, given the events of the previous month. On April 12, South Carolina militia forces bombarded Fort Sumter. On April 17, Virginia seceded from the nation. On April 19, President Lincoln ordered naval blockades of all southern ports. On that Sunday in May, Bishop Atkinson was assisted in consecrating the new St. Paul’s Church by two men: the Rector, the Rev. David D. Van Antwerp, and the Rev. Alfred Augustin Watson, Rector of Christ Church, New Bern. Van Antwerp was a Union officer and Watson was an officer of the Confederate Second North Carolina Regiment. That kind of cordial cooperation within the church made for a strong foundation. Nevertheless, the war took its toll of the parish. Although Van Antwerp remained as Rector, he was unable to attend diocesan conventions from 1862 through 1864. 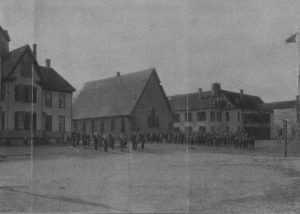 Van Antwerp left St. Paul’s in 1867. The St. Paul’s School would remain closed for another generation before reopening in 1899 under the direction of then Rector Thomas P. Noe and Mrs. Nannie Geffroy, headmistress. The school operated continuously until 1939. In 1951 a rectory was built on the site of the main school building. 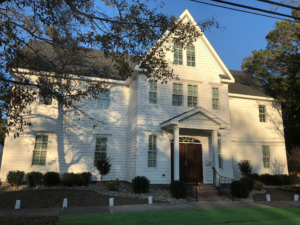 In 2017 the rectory was replaced with a modern multi-purpose building designed to replicate the handsome original school building. Today’s parish house occupies the site of the school’s old dormitory and dining hall. British colonial rule brought the unique liturgy of the Church of England to many lands. The Anglican Church still seeks to bring together two seemingly divergent elements: the depth and richness of the apostolic tradition of the early church and the many gifts of the Reformation. The Society for the Propagation of the Gospel, or SPG, took on the responsibility of sending Anglican missionaries to the colonies. North Carolina was one of the last colonies to establish the Church of England as the “official” church of the state, early in the eighteenth century. This was largely because of the religious diversity of the colony’s early settlers. Shortly after Beaufort began to be settled in 1709, North Carolina passed an Act of Establishment declaring that all laws in force in England for the establishment of the Church and for granting indulgence to Protestant dissenters were to be in effect in North Carolina. In 1715, a new Vestry act passed, dividing North Carolina into nine regional parishes and naming twelve vestrymen in each parish. This act authorized these vestries “to use their best and utmost endeavor to procure an able & Godly minister qualified according to the Ecclesiastical Laws of England.” It raised a priest’s salary from thirty to fifty pounds a year, and permitted the levy of “a poll tax not exceeding five shillings per Poll on all the Taxable persons in the parish” for the financial support of these parishes. At this time, Beaufort was a part of Craven Parish. In 1723, one year after Beaufort’s official incorporation as a town, Carteret Precinct was designated as St. John’s Parish. The word “parish” in this sense does not refer to a specific church, but rather designated a religious and political boundary area. The first vestrymen of St. John’s Parish were Christopher Gale, Joseph Bell, John Shaw, John Nelson, Richard Whitehurst, Richard Williamson, Richard Russell, John Shackleford, Thomas Merriday, Enoch Ward, Joseph Fulford and Charles Cogdail. 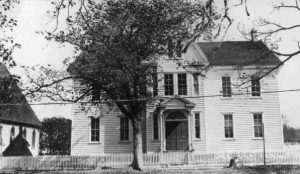 In 1724 a half-acre lot with a building upon it, was deeded for use as a courthouse and church until such time as a proper church building could be built. The courthouse was used for Anglican worship services for a number of years. Other chapels, served by the Rector of Christ Church, New Bern, were constructed as well. Bell’s Chapel was built in 1748 on the southwest side of the Newport River. Another was built in 1761 on the east side of Fulford’s Creek at Strait. The Reverend James Reed, a man of whom Governor Tryon was quite fond, came from England to become Rector of Christ Church, New Bern in 1753. At three times during the year, Mr. Reed held services at each of the chapels of St. John’s parish. In 1774, David Lewis of Beaufort died and left the sum of £100 for the construction of a new church building. Work on the building began almost immediately. It was described as “small, old fashioned, with immense stone pillars.” The pillars were probably built of ballast stones (not architectural columns), upon which the building sat. In 1776, as construction drew to a close, the Revolutionary War caused the Church of England to disappear from the American colonies. Anglicans stopped using their new building in Beaufort, which was shortly thereafter used by Methodists. Although records exist for St. John’s Parish after the Revolution, they generally have to do with the parish as an organization for social welfare, but not as an organized worship community. A substantial period of relative inactivity followed. Anglicanism effectively disappeared from Carteret County until Rev. Van Antwerp’s initiative in 1855.